I received an email saying that I am one of the chosen bloggers who can try out the newest service of Mang Inasal! You see, they have just recently made Mang Inasal more accessible and convenient for its loyal patrons by having a one-number delivery system where you can enjoy your favorite Mang Inasal meals right at the comfort of your home! I've always been a fan of this brand after I've read it's success story in the November 2009 issue of Entrepreneur Philippines. 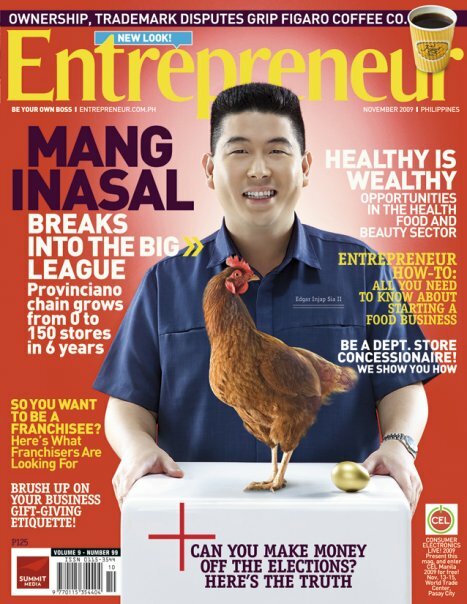 It talks about a young man named Edgar "Injap" Sia who began his chicken business in the Visayas region, and who now has more than 300 branches nationwide and still growing. Just to show how successful Mang Inasal is, local diners see this growing chicken chain as the closest competitor to the happy bee and the friendly clown in yellow and red suit. With Mang Inasal's very affordable chicken meals and unlimited rice, they are now enjoying a growing customer based from the students to working individuals and even from moms wanting to serve clean chicken inasal to her family. For dinner this week, I availed of the Mang Inasal delivery by dialing 733-1111. It only took 2 rings for my call to be picked up and after getting my contact details, the girl told me to wait for approximately 30 minutes for my order. I really wanted to see if they will keep their word and I set a timer on my cellphone. I called at exactly 645PM and I am expecting Mang Inasal to by at our doorstep by 715PM. While chatting with Manang and Paul, I heard the doorbell ring. It was 715PM and right on the dot, our Mang Inasal orders have arrived. Amazing! I truly hope they'd keep this great on-time service as nothing makes ones dining experience worst than nursing a growling stomach while waiting for your food to arrive. We have two orders that evening : Paborito Meal 1 (Paa with Rice) and Paborito Meal 2 (Breast/Wing with Rice). We chopped the chicken into smaller pieces to share with the entire family. Paul noticed that the rice was still very warm which added more points for their superb quality. I love Chicken Inasal and I'm glad that Mang Inasal's version was not dry yet was very flavorful and tender. It's pretty good that I can enjoy one entire meal on my own! The best part is, their Paborito Meals are all below P100! Craving for chicken? Just dial 733-1111 and enjoy Mang Inasal's delicious Chicken Inasal without leaving the comforts of your home. * thank you Yehey.com for the Mang Inasal treat! Yahoo! Believe it or not, I haven't tried Mang Inasal, hahaha! Now that people are saying masarap pala..I'll make a beeline soon. w00t!